Anglers, boaters say law violates public trust, is unconstitutional. 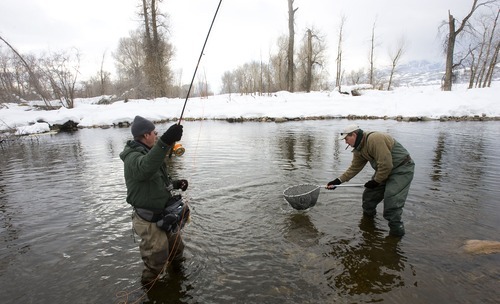 Al Hartmann | Tribune file photo Fsihing guide Ken Mahal, left, catches a brown trout in the chilly water of the Middle Provo River as Kevin Foley nets the fish. 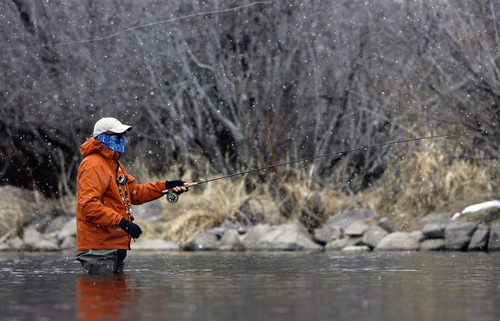 Francisco Kjolseth | Tribune file photo A fisherman casts his line in the snow on the Middle Provo River near Heber City. 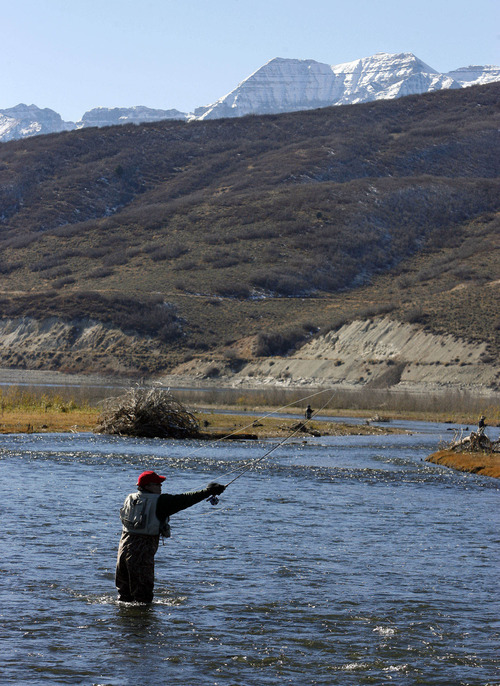 Chris Detrick | Tribune file photo A fisherman casts his line from the shore of the Provo River. Al Hartmann | Tribune file photo A fisherman tries his luck on the Middle Provo River where it enters Deer Creek Reservoir, just south of Midway. Heber City • In the 1880s and 1890s, the Provo River through the Heber Valley served as a floating highway for timbers and railroad ties logged in the Uinta highlands. That century-old practice is being cited today in court to argue that Utah boaters, anglers, hunters and others should be allowed access to waterways even when they flow through private property  access that has been blocked by a law adopted in 2010. Representing the Utah Stream Access Coalition (USAC), attorney Craig Coburn argued last week in a Heber City courtroom that HB141 violates the "public trust doctrine" in a case that highlights the growing tension between private property and recreational access to public land and waters. Public trust is a centuries-old legal concept that maintains certain natural amenities  like coastlines, lakes, rivers and their beds  remain public domain because of their importance to commerce, according to University of Utah law professor Robin Craig. USAC claims the doctrine imposes a duty on government to manage such assets for the benefit of the public, while streamside property owners and the state say the government meets its obligation by simply retaining title or control. "The public has the same right as the owner of that [river] bed to use those waters. It includes the right to reasonably touch the bed. The only caveat is the public has to gain lawful access to those waters. They can&apos;t cross private land to get there," Coburn told 4th District Judge Derek Pullan on Tuesday. HB141 made it so anglers, kayakers and others have to get a landowner&apos;s permission before walking on the private bed of a public body of water. Coburn said this law thwarts the public interest to the exclusive benefit of private parties and is tantamount to a "reverse takings." But HB141 serves a public purpose by protecting public safety and balancing the competing interests of various stakeholders, the state responded. "It rewards those who were taking care of the property. Those next to the water would have greater interest in maintaining it," said Thom Roberts, an assistant Utah attorney general. Absent a "disposal" of the resource, there can be no public trust violation. Taken to its extreme, the anglers&apos; position would bar dams or other vital projects that would render streams unfishable, he said. In the coming weeks, Pullan is expected to rule whether HB141 runs afoul of the public trust doctrine, but whichever way he goes, the Utah Supreme Court will have the final say. Meanwhile, Rep. Kay McIff, the Richfield Republican who sponsored HB141, has introduced a new bill that would restrict the reach of the public trust. A former 6th District judge, McIff likened the doctrine to a wild card. "It means whatever the holder declares that it means. Its options become as numerous as the cards in the deck or, when applied to government, as numerous as the states in the union. It has been used to supersede legislation and undermine vested property rights," he wrote in a letter explaining his new bill. His new bill, HB68, would limit the state&apos;s public trust obligations to those spelled out only in statute and in the Utah Constitution. According to law professor Craig, the states&apos; approaches to the public trust are extremely varied. Some states have an expansive view, like Hawaii, California and New Jersey which require easements across private land for the public to reach beaches. On the other end of the spectrum is Arizona, where the Legislature has enacted laws eliminating public trust, only to see them invalidated by that state&apos;s supreme court. "The access issue is a difficult one. The doctrine came at a time when you didn&apos;t have private ownership of every inch of shoreline," Craig said. "Access is a newer development that came about because so much land went into private ownership that public access has been cut off." The Utah stream-access lawsuit centers on a property owner&apos;s steps to exclude anglers from the Provo River, among the state&apos;s most revered trout streams. But the main goal of the suit is to invalidate HB141. Triggering the suit was Wasatch County sheriff&apos;s deputies&apos; practice of issuing trespass citations to those fishing the Upper Provo where it flows through the Victory Ranch Club, a high-end golf resort upstream from Jordanelle Reservoir. Such actions undermine an important economic driver in Utah, said USAC member Chris Barkey, an angler from Draper. 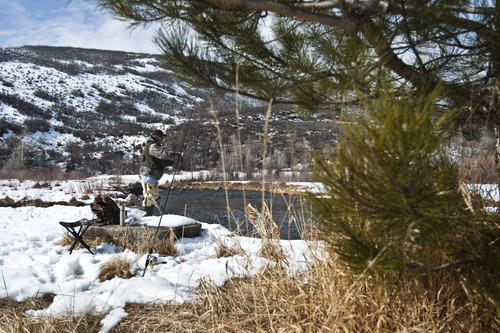 In 2006, 375,000 anglers bought Utah fishing licenses. Their fishing generated a total economic impact of $708 million that year and supported 7,000 jobs, according to a Utah Division of Wildlife Resources analysis. The streams most conducive to fishing, those crossing bottomlands, tend to be the ones HB141 closes off, Coburn said. Pullan has already ruled that the public has a constitutional right of access to rivers and the state has the authority to regulate that access. But he declined to rule on the applicability of public trust doctrine until after considering further pleadings from the parties, including a property rights group represented by former Utah Supreme Court Chief Justice Michael Zimmerman. He was concerned the doctrine opens the courthouse door to "anyone, anywhere" who opposes how the state uses publicly owned resources. "If the state leases land to graze, can someone in Salt Lake who doesn&apos;t like beef then claim that they can no longer walk on the land?" Zimmerman posed at Tuesday&apos;s hearing. What is the &apos;public trust doctrine&apos;? Some natural amenities are so important to commerce that they should not be privately owned, according to this legal doctrine that dates back to Roman times when authorities sought to preserve public control of coastlines. But in Utah the public trust doctrine is now cited to ensure public access to waters that abut or flow through private property. This issue has sparked showdowns in the courts and in the Legislature.